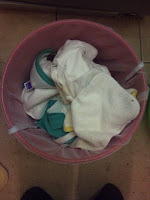 I think this challenge is one of the most important from a 'non' cloth user's perspective as many of my Mummy friends who see me using cloth nappies on Elizabeth's botty, like the idea of them but tell me the main thing holding them back is the washing and drying! How much extra washing do you need to do? Do you need to soak them? Will you need to boil wash? What do you use to wash them? Can they be tumble dried? 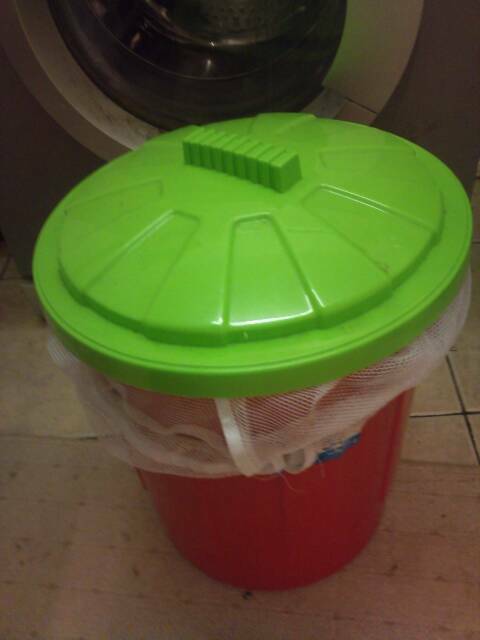 I store my cloth nappies in a bucket, we originally had a proper nappy bucket, but they are tiny! Designed for when cloth nappies were terry squares and took up much less room, the one we had barely fitted a days worth of nappies in! 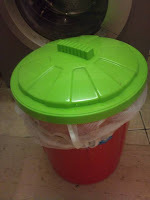 So on the advice of the lovely Lisa at www.birth2potty.com we went to 'the range' and bought a 21l plastic lidded 'fun bin' designed for toy storage. This now allows us to store up to 3 days of mucky nappies! If we're out and about I use a wet bag to store them in and then tip them into the nappy bucket (which is lined with a Bambino Mio mesh bag) when we get home. We have two rather mucky children, so do rather a lot of washing anyway, however now I am used to it I don't even notice the extra machine load when we do our nappy washes every 3 days! If you have at least 20 nappies (and a big enough bucket!) You should be able to get away with a nappy wash every 2 days. Most families I know have the washing machine running on a daily basis anyway so it doesn't make much difference! I don't soak the nappies. 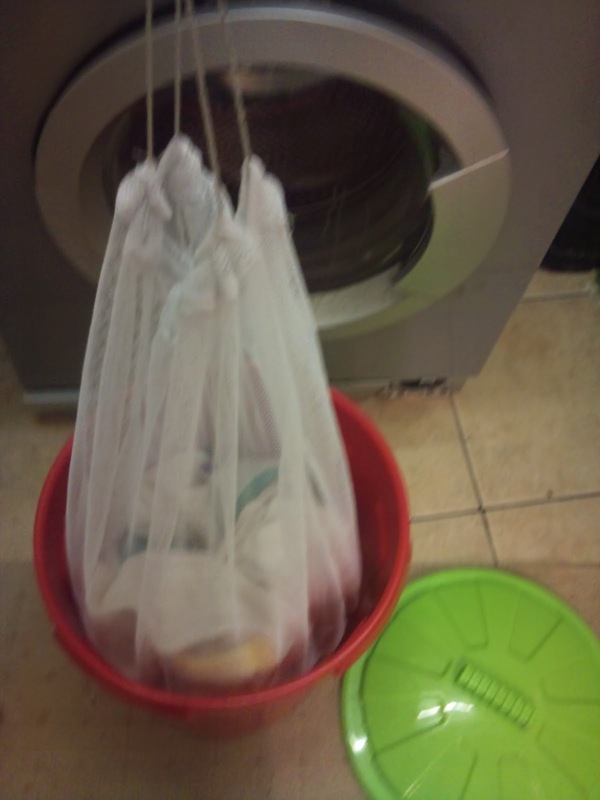 I dry pail (store them in a dry bucket with a mesh bag inside) them and then do a cold rinse in the machine before putting them on to wash. This seems fine for removing any stains or marks. 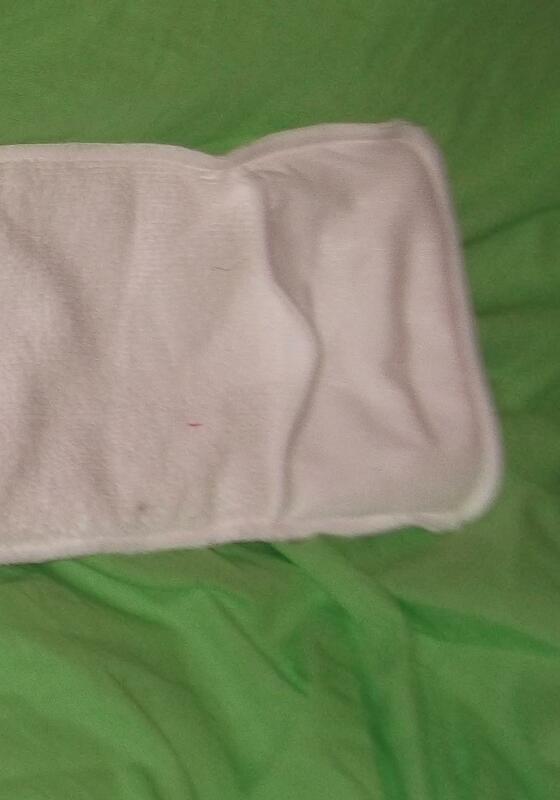 You do not need to boil wash cloth nappies these days! I wash them like all my other laundry at 40 degrees. In fact if anyone tried to get my 'stash' anywhere near a boil wash I would not be a happy Mummy! It would ruin them!! 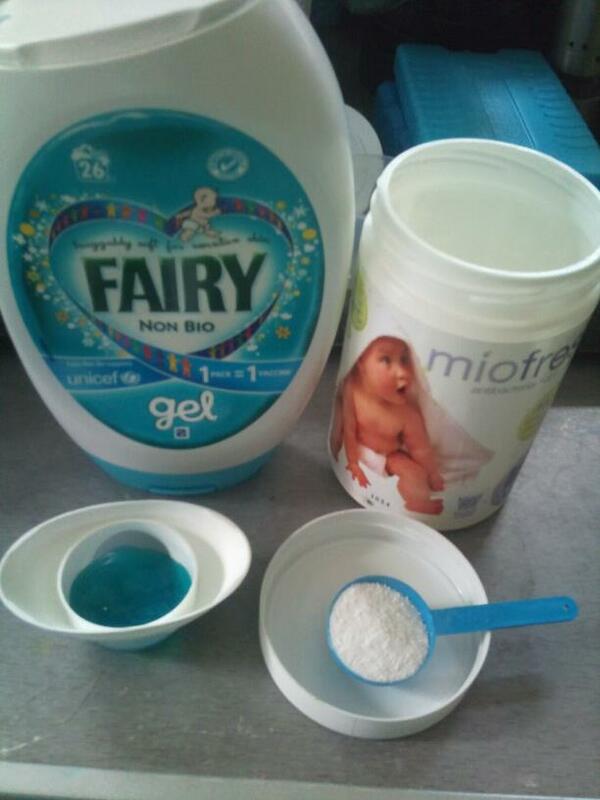 You do not need anything special to wash cloth nappies, I use half the usual amount of my laundry detergent (fairy non bio gel) and a scoop of Miofresh antibacterial nappy cleanser, on a normal 40degree wash. Fabric softener should not be used in nappy washes as it decreases the absorbency of the Nappies. The drying time for Cloth Nappies depends on the type on nappy and the material its made of. Microfiber tends to be the quickest drying (I have had microfiber inners dry on an indoor maiden in less than 2 hours) where as bamboo takes a bit longer. Some nappies can go in the tumble drier, with most of our 'stash' the 'inners' are tumble drier safe but the outers are not. 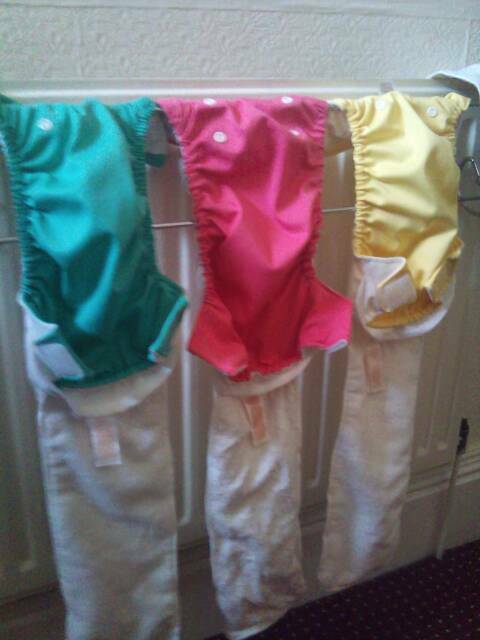 With AIO Nappies such as the Miosolo it is usually safe to pop the whole nappy in the tumble drier. Obviously using the tumble drier to dry nappies at every wash uses up a LOT of energy, so when ever possible I will line dry or maiden dry the nappies ( I think a washing line full of beautiful colourful nappies really is a fabulous sight!) However there are circumstances when I need to get them dried quickly, so in these situations the tumble drier comes to my rescue! How did the Miosolo wash and dry? So that covers the common questions that I get asked about washing and drying nappies but what I'm sure you will be wanting to know is how did the Mio Solo's wash and Dry? Were they easy to wash? Quick to dry? Do they have any unique features? I have washed all three of the miosolos a few times now and I have found they wash really well. Even after the biggest, smelliest poopy nappies they have come out totally white with not even a hint of a stain and smelling fresh as a daisy! The Mio solo nappies fasten with Velcro, and of course if these were loose during the washing and drying process it would catch on other nappies and cause pulls or bobbling. So to prevent this the Miosolo's have handy fold over tabs to keep the Velcro tucked away. The velcro on the miosolo's is really strong and these stayed tightly fastened throughout washing and drying. I have to admit when I first received these nappies, I was rather confused by the two loops on the tuck in 'insert' After reading the packaging I discovered they are there to help you pull out the insert when washing and drying! What a clever little idea! The loops do make it a lot easier to pull out the insert when the nappy is wet! At the end of the nappy inner there is a little fabric pocket, I found this really useful when I used the mio boost as it helped to keep this in place, but I also found it handy when I have washed the nappies as it is great to pop your hand in when tucking the nappy back together and ensures you have it in place properly! As I said when possible I try to avoid using the tumble drier but sometimes it is just necessary! So I have dried these nappies both in the tumble drier, on a maiden and over a radiator (unfortunately we haven't yet had the weather for line drying!) When the tumble drier was used the nappies dried well and came out lovely and fluffy. When drying on the maiden, I left them in the spare room overnight and they were dry in the morning, not as fluffy as in the drier but still lovely and soft. On the radiator (on a rack, not directly on it) with the heating on they dried in around two hours. I was very impressed with the drying performance of the miosolo. Although I knew they were made from microfiber (which is known for being a quick drying material) I had imagined that being an AIO (where the inner could not be separated from the outer) would hinder their drying speed. But this has definitely not been the case! The only negative thing I have noticed is that after washing and drying a few times the inside of the nappy (the part that's next to E's skin) has started to bobble, it's not too bad at the moment but doesn't look great on a nappy that's only a few weeks old. I don't know how it has happened as all velcro tabs have been tucked safely away during washing and drying. 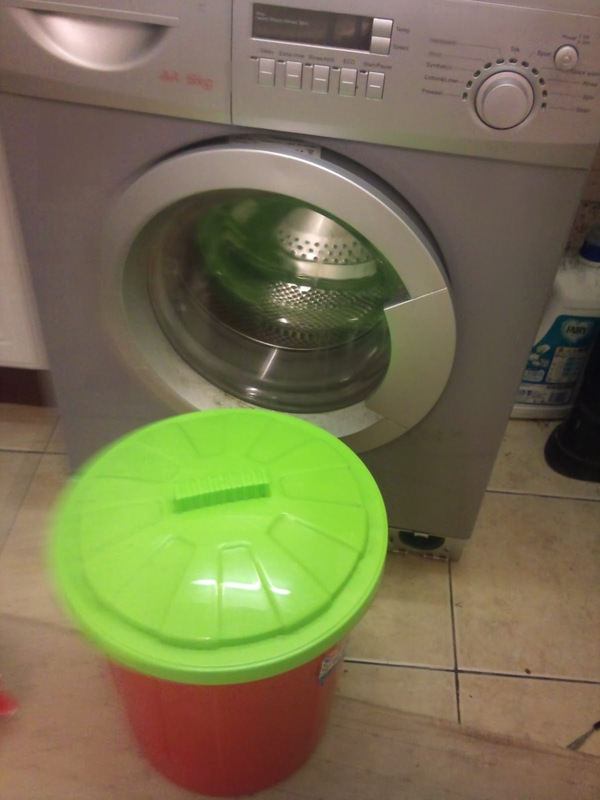 Overall the Miosolo's were very easy to wash and dry and performed well in this task! So that is the final challenge! I have really enjoyed using the Miosolo's this week and taking part in the tasks set by Bambino Mio! As a cloth nappy user already I like the fact that these nappies are great fitting, reliable, easy to use, lovely to look at, wash well and dry quickly. I am now confident that this new AIO nappy is going to be perfect for nursery! Not only is is very simple to use (Even Daddy could do it!) the drying speed means that I could easily get them dry over night, ready for sending to nursery the next morning! I would definately recommend these to Mummies who currently use disposables but are concerned about their impact on the environment and their contribution to the 'nappy mountains' at landfill sites. These are so easy to use you will hardly notice the difference and if you don't want to pay out a large amount in one go you could easily just get a few and use them along side disposables while you get used to the difference, then gradually build up your stash! This is the last of my #Miosolochallenge posts but I will be blogging more about cloth nappies very soon so watch this space.... and check out my latest competition! If you have any questions about washing or drying nappies feel free to leave a comment and I will do my best to answer!